...the full text document (10 pages). For summary see below. This guide to chess analysis symbols is recommended to beginner and intermediate players. A tried and true introduction for those ready to move onward, and upward! (2 pages)Below are some popular openings to start with. All C&O students should register on Chess.com to access additional instruction, and regular practice with other students and staff. Welcome scholastic players! This page is especially for advanced beginner and intermediate players, those whose club rating is Level 5 through 12 (USCF 500 - 1200). However, there is plenty here for lower and higher rated players as well, particularly if you are relatively new to tournament play or other organized chess. When many students get to Levels 4 or 5 (USCF 400-599) they find that they are better than most of their friends, but may also find that they have stopped improving. Lessons with a private coach or our Saturday Morning Chess Club can definitely help, but many students are too busy to add time for a coach or another class. We have an answer! This page of our website is devoted to you. without "the will to prepare!" One of my students had that written on the back of his T-shirt and it struck home right away. Too many students think that just getting older is enough to achieve all of their goals. Not so! This is especially true of some players with a lot of natural talent! If you have come to a point in your chess career where you are bored because the competition is too easy, or discouraged because they're too tough, you may find some suggestions, here, for changes in your routine to make chess fun again, as well as improving your skill. One step you can take is to learn a new way to open the game. In the left margin are some downloads to help you get started. Try this one first: How To Learn an Opening. We have also been adding basic opening videos for all players. Check out our Chess.com/YouTube offerings on our "Links, etc." page. The single best way to improve your playing ability (and it's free) is to "play over" and analyze your own games, identify the mistakes, and find improved moves to help you in your next game. In order to do this you must be able to "record," or write down, the moves. You can learn how to read and write chess notation very easily from our Journal download on Students I or from the CMS lessons or Chess.com. It may seem distracting at first, but regular practice quickly makes the task easy. Then you can even show your games to friends or take them to a coach for an instructive lesson. Score sheets for easily recording moves are also available on "Students Page I." Any student who wants to play against students from other schools, is welcome to come to the Lakeforest Mall (LFM) chess club in Gaithersburg. That club, located in the food court, offers relaxed and friendly "free play" to everyone, seven-days-a-week. It was started for players of beginner and intermediate strength... players just like you and your friends. You are welcome to bring friends and/or family members when you come. Friday evenings, and Saturdays from 12:00 noon to at least 4:00 PM, are usually the times with the most scholastic players. Saturdays is usually when Coach Omar Pancoast is scheduled to be there from 9:00 to 1:00 or 2:00 PM (see the "Saturday Morning Chess Club" on the "Instruction" page). However, there are players there every day and you can find many experienced adults who are willing to give you a game and a few pointers. You may also meet and play some high-ranked players. See the LFM Club page for more details. For higher level competition you are also invited to play on the internet at Chess.com. That site is now our "standard" online place for competition with fellow club-members and others, including coaches and players from around the globe. Free registration provides basic features, unlimited play, new friends, and study with articles by master players from all over the world. Coach Omar also offers online instruction there at reasonable rates (see the "Instruction" page). 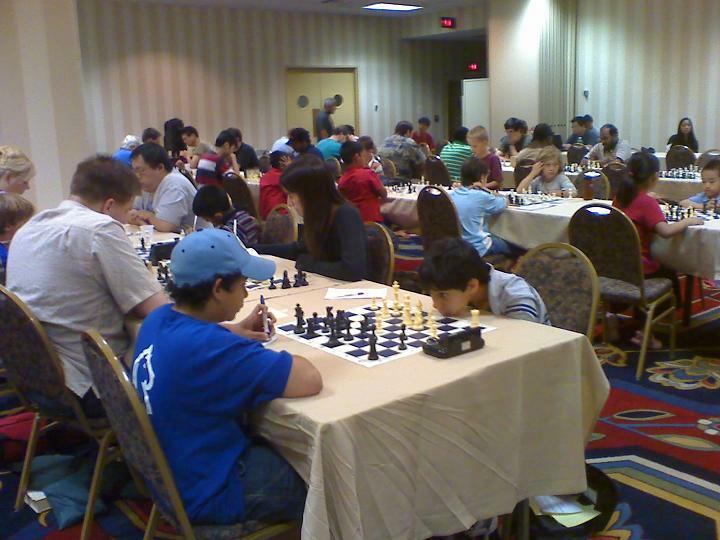 For USCF-rated competition check out local and MD State tournaments. See the Events page for details. Chess.com offers online tournaments for players of all levels.